I was looking at the always-awesome Earth Observatory website from NASA and came across an interesting comparison of images of a river delta over time. The first image below is the Huange He delta in 2000. The comparison image below is from 1979. Compared to the earlier image, the 2000 shot shows an increase in developed land and a slight decrease in vegetation. The most striking difference between the two images, however, is the shape of the coastline. 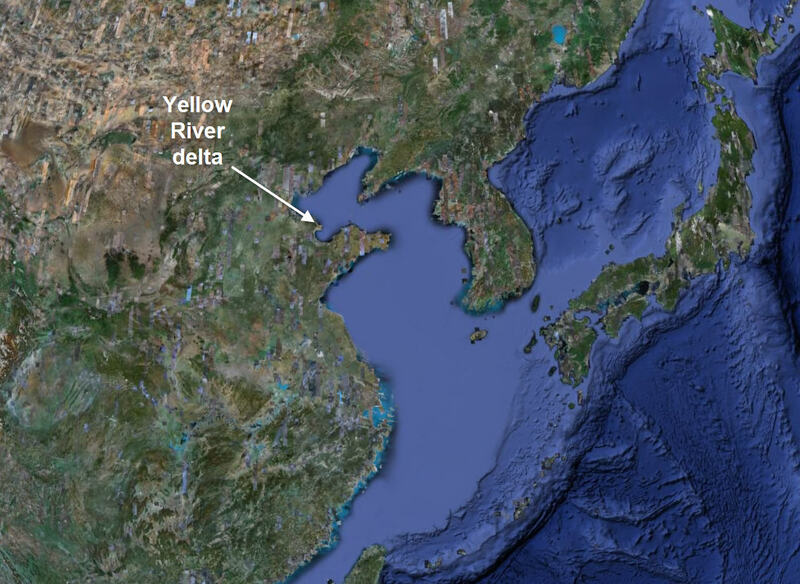 A steady supply of sediment expanded the Yellow River delta until it pushed into Bo Hai like a giant hook. Sediment colored the coastal waters bright blue. This delta-building process has added several hundred square kilometers of land to China’s coast. I wonder if the change from a “smoother” coastline to the more “birdsfoot” river-dominated morphology has mostly to do with the land use changes? That is, a more restricted river course would preclude frequent avulsions and construction of the distributive dispersal pattern. A more restricted river course would result in more spatially focused growth. I don’t know … just thinking out loud. In case you are wondering where this delta is along the China coast, here is a regional GoogleEarth image. See all the sharp lines along the coast in the 2000 photo? And a discrete line along the north bank river channel in the center? Most likely all levees and control structures like we see at the Mississippi’s mouth–all greatly increasing sediment transport capacity and pushing the sediment deposition zones farther out into the ocean. You’ll have to do some research then.